Sorry for the hasty picture. It did not focus up inside but I do think I see the female end of that extension. I couldnât get my fat head in there at the same time fitting a flashlight and camera up there. I just tried a random picture without looking. 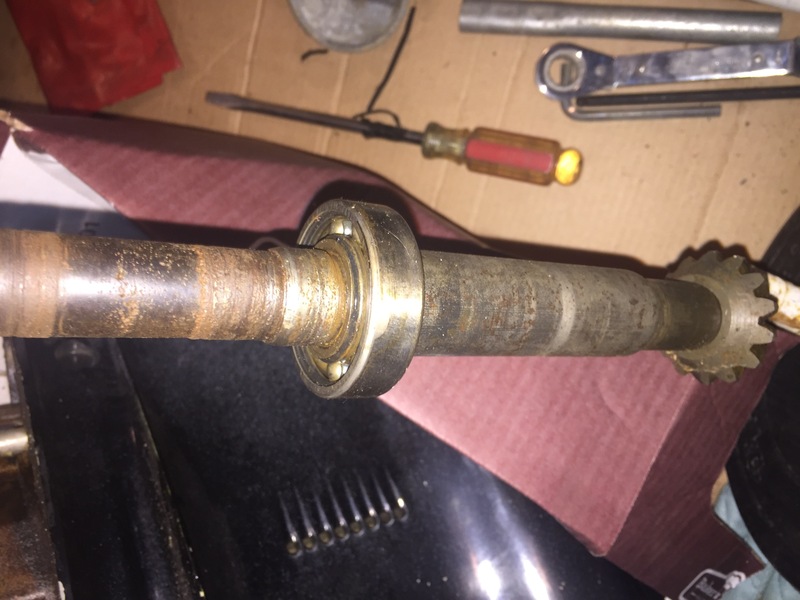 get a extra drive shaft and use heavy grease in it to hold the extention on so you ca turn it to remove it. That sounds like plan A. I believe I may have a loose shaft in a parts box on my high storage shelf. Since I do not have new thick grease, would it be ok to use some old grease from some ten year old buddy bearings laying in a box? Seems pretty thick and gooey last time I looked. 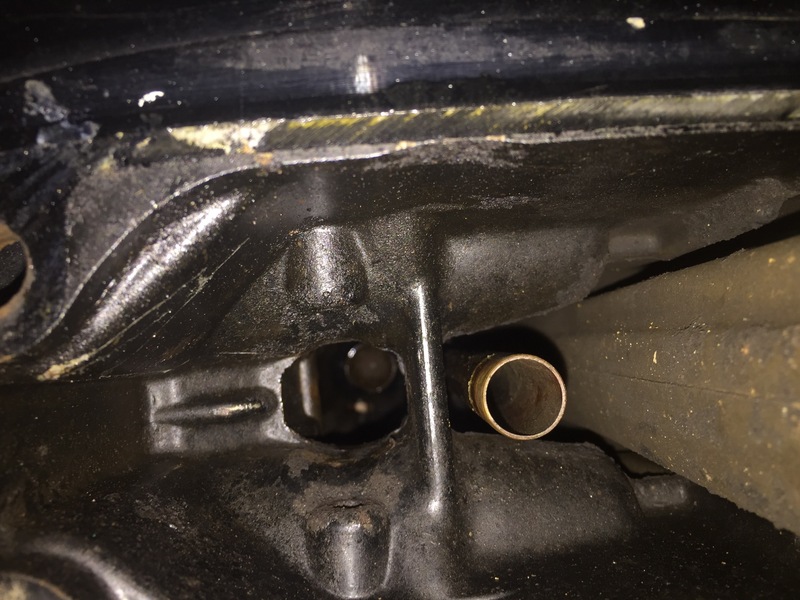 Here is a picture using Edâs advice to reinstall lower unit shaft unit it seats into female upper splines and see if you still have the 4 inch gap. It does. I then removed the lower unit. Then I planted my Christmas cookie weight on the back of the stand and tilted motor up. Using a flashlight, I can see that shaft extension. 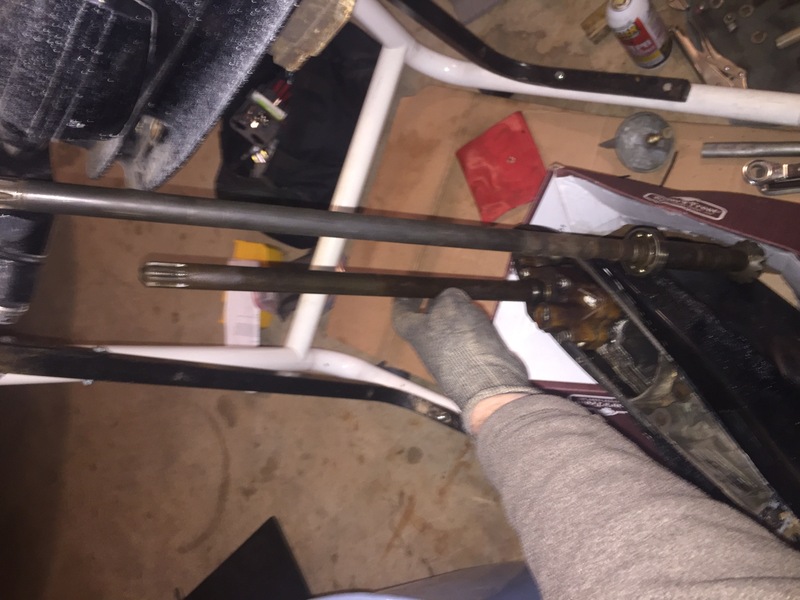 I dug through the parts box and found my loose long shaft. I slipped it up in there dry just to see if I could easily seat it and turn over engine. That works... but when I wiggle side to side, it hits the mid sections housing casting on all sides before it puts any load or bind on the shaft connection to the crank. I will have to try putting on thick grease and then a few gentle but firm upward strikes straight up to see if small shock will listen its grip. Maybe I can spray some pb blaster up into that joining point??? If you want to really get Wild and Crazy, spray some carb cleaner up into those splines, so it's as thoroughly degreased as possible. You could run a hunk of fuel line or other suitable tubing up the exhaust tower to help direct the spray. Clean the splines on your loose driveshaft, too. Smear some epoxy glue or J-B Weld on the splines & cram it up into the crankshaft splines. Let it cure for a couple of days. Then hopefully when you wiggle the shaft, it'll transmit more motion to the driveshaft stub. It might even hold enough for you to tap the loose shaft downwards. Thanks Ed. I have Carb cleaner and think I have some clear snowmobile fuel line I could use for an extension delivery tube. I also have some West System 2 part epoxy, or 3M 5200, or also have JB weld...which would be best (I may have to read which will work in 40 degree temperatures)? I had wondered about this technique, but had no experience if I could later separate those 2 shafts. If I pretend to try, but not really try hard, I would be forced to pull Powerhead...that would likely lead to a year delay while the temptation to convert it to a 135 would be likely changing my original plan. At temperatures below 50 F and above 32F the cure time is about double, 10 to 30 Minutes as compared to the 5 to 15 min at room temperature but the finished bond strength is not affected. At temperatures below freezing it may take 1 to 2 hours to fully cure and may never reach it's normal full strength but is still quite strong once cured. For best results warm the parts with a hair dryer before assembling and allow the epoxy to form a bead around the joint then hold in place nice and steady for at least 15 minutes then avoid putting any stress on it ( driving or slamming the door! ) for at least 30 minutes. Hello, the minimum application temperature for the 3MÃ¢ÂÂ¢ Marine Adhesive Sealant 5200 is 40 Degrees F. Do not apply at temperatures below 40ÃÂ°F (4ÃÂ°C) or on frost covered surfaces. Suggested application temperature should be 70 Degrees F. Applying at lower than recommend temperatures will cause for a slower than normal cure. So perhaps you can heat up the parts somewhat to aid the cure time. 5200 is pretty dang sticky, and once cured the shafts should stay together good enough to get some force on the parts. Normal cure time might be a week or so with that stuff. 5200 Fast Cure works in 24 hours but it'll take longer in the cold. 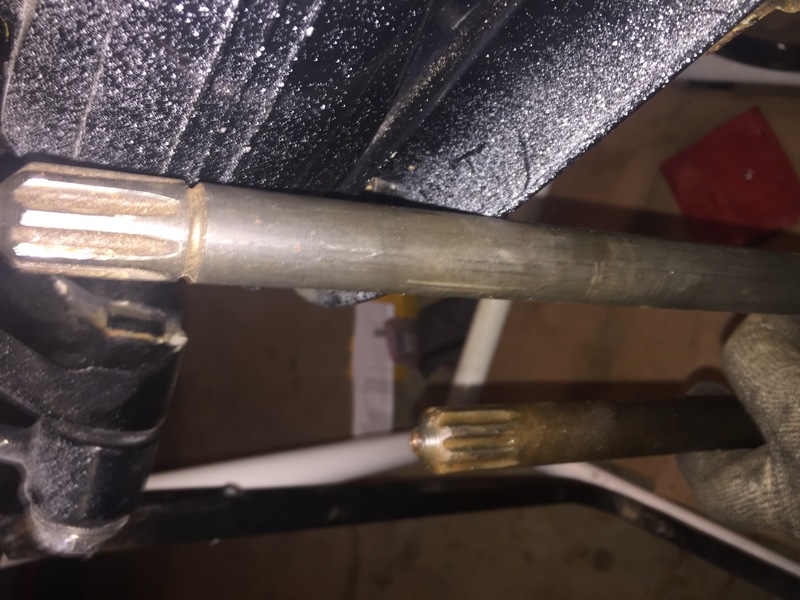 Perhaps a torch on the driveshaft splines, and if you have a hot air dryer or heat gun, point the blast up the exhaust tower for a few minutes and try to warm up the stub shaft a bit. Should help with the cure times. JB Weld, fully cured, has a tensile strength of 3960 PSI; 3M 5200, tensile strengh of 700 psi. It's primarily a very sticky sealer but I reckon the JB weld cures a lot harder. Which is better for your application? Anybody's guess. Try the JB Weld and see what happens. It'll have a much shorter cure time than 5200. 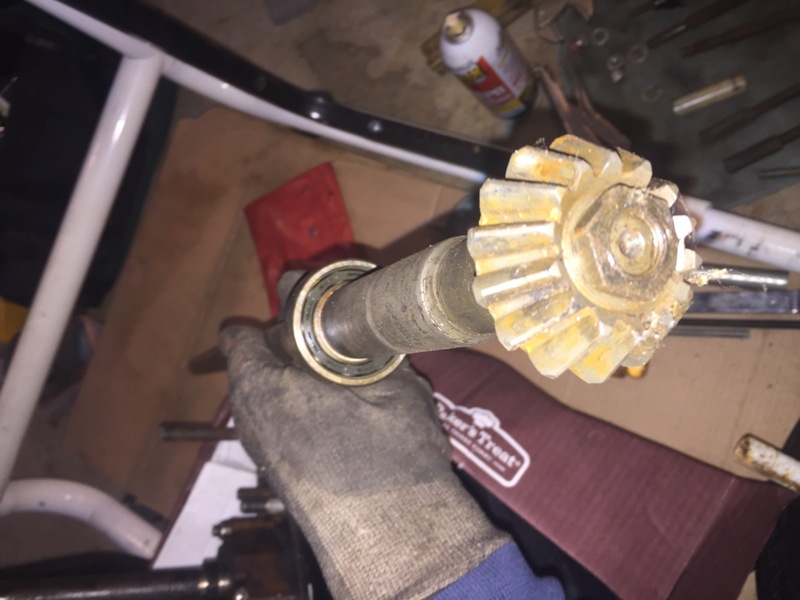 When I first started reading Ed's post about the carb cleaner sprayed up the hole my first thought was that he was going to say "Lite 'er up"
Show us pictures with the shaft out. Wow - great information for me to ponder. Looks like maybe I will save my 5200 for summer boat work. Likely the JB weld sounds promising and using all of the preheating should help. I just realized I need to do one more thing in case everything bonds well yet maybe the stub stays stuck. I need to remove the lower bearing on that shaft... because if everything sticks and my last resort is to pull the powerhead, it doesnÃ¢ÂÂt look like the diameter of that bearing will fit past the casting throat near the bottom. I will look at that next. I really appreciate all of the help thus far. I will stay positive and hopefully patient to ensure the stub shaft comes out the bottom with the fused bottom long shaft. Honey do list today... also putting the repaired dash cluster of gauges back in my wifeÃ¢ÂÂs 2005 Ford. All gauges stopped working except one. For anyone interested, I used Circuitboarddoctors.com for amazing service from North Carolina. Maybe they can fix electronics for boats? Fair price, full warranty, and do the work in one day from receiving. Ok - I better get my rear in gear and keep this rolling! OK, "Lite 'er up"! It might take some C4 or a low-yield tactical nuke to get that stub shaft outta there!! I don't think that the "loose" driveshaft would ever clear the tower innards, going upwards with a pulled powerhead. Pretty sure the larea below the ball bearing is much larger than the diameter of the stub shaft. Which brings to mind, it's pretty tight in there and I can recall reinstalling one of these Bay Marine extension kits and the stub shaft wouldn't clear the tight part in the mid. I had to pull the stub off the shortie L/U's driveshaft, then push it up into place with an extension, wiggling the stub past the tight spot. So, depending on the "throat" of your mid, it might be the same thing going downwards. You could get stuck right there with the stub shaft glued to the loose driveshaft. 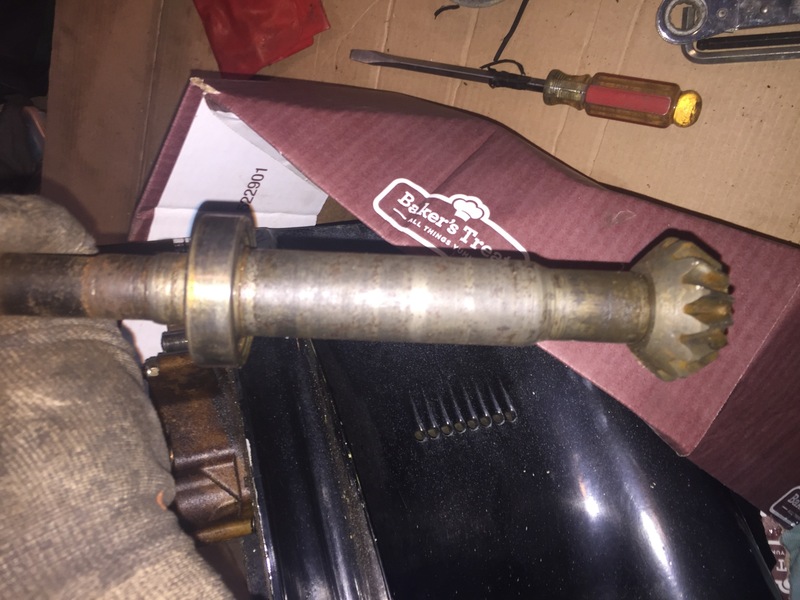 At which point you'd be forced to pull the powerhead anyway, then you could stick the driveshaft up as far as it would go and heat the stub with propane or MAPP torch until the glue releases. So, we'd like to avoid that if possible! If you have a long, coarse-toothed file, maybe it'd be a good idea to "relieve" a bit of metal at the tight spot and then hopefully the stub shaft will pass. Good points and I do understand what you are getting at. I did notice something when looking up inside at bottom of the stub shaft... even though the bottom end has a larger diameter due to it being the female receiving end, I notice that there are flat sides on the outside that are 180 degrees opposite of each other. I will look back in this thread as I think I remember Doc mentioning this and to rotate it so it fits down through the lower casting on the mid section. I canât get a focused picture of it with my phone. I can see that if it were too fat, that I could file it. Trying to not modify anything. Though this project is hard to work on every day due to other things, I am trying to beat the clock as I will have shoulder surgery in less than 2 weeks and wonât be able to touch it for 2 months. I need to have the shaft out before then or it will drive me crazy. Which JBWeld to use? Original or 4 minute quick set? I would likely let either set up 24 hours. As you probably already know, I'm a bit of an outlaw when it comes to some of these procedures. If you have a spare crankshaft, so you can determine just what diameter wooden round-stock will fit in it snugly, you can drive a tapered wooden dowel - perhaps a replacement broom handle, etc,...Into the female extension. Then wiggle it around, and pull it down and out with the needed rotation required to fit through the oval area down low in the driveshaft housing. Once again the Doc is thinking outside the box! Great idea, and if you find a wooden dowel that's a slight interference fit into the splines, the wood will deform and lock-in to the stub even better! HO-HO-HO and a Merry Mercury Christmas to one and all! Thanks a ton for the last 2 comments. I had not had a chance to get back to it, but hope to they the wooden dowel Sunday night as my plan A first attempt. Sure would make me a happy camper to get this removed before my shoulder surgery Thursday. This method sounds promising. I have an old snow shovel wood handle from a 35 year old shovel that was too good to toss when the shovel head finally broke the bracket welds. It is stout and also tapered. Hey - I just realized that darn shovel is probably what wore out my shoulder ha ha. Merry Christmas all. Getting ready for the surgery this week will be priority 1. Repair or replace? The admiral has her last rehab Monday, did a complete replace and that failed because someone gave her a sympathy hug and tore the ligament Then had to have another surgery to reverse the socket/ball, only option left. Sorry to here of setback! Yikes. Hope your significant heals up completely this time! Trying to keep shoulder parts and fix 3 tears. Fix damaged bicep tendon and grind off some bone...I should know better not to lift those tall Mercs by myself! It is too late tonight, but I really want to get in that garage and try a few removal attempts (with pictures) before Thursday. Sorry I ran out of time before todayâs surgery. I didnât have a broom handle I could spare last minute. Tried one last time with the spare shaft jiggling quickly in both directions with no luck. I hope I can continue this thread after recovery, but I will have to be patient. Priority #1 is yourself right now. For all our sakes please do not post anything while under the influence of pain killers. Don't want you to write anything you might regret in a few weeks. While I write this you're probably under the knife so prayers going your way. Home and recovering. Good advice Cal. No posting while medicated. Signing off so I can ease the slight discomfort as the Medical Doctors say when actually referring to pain. I will finish this thread when I can do I can share the technique that worked to help others if they ever buy one of these engines with the extension. Seems all of the Merc 85XS motors I have seen had this extension which would help that engine work on lots of boats. Twin short shaft 85XS motors would be cool on a small classic cat or other specialty performance boat that could handle the weight. Almost bought a rig that had one I wanted to shorten, but way too much wrong with everything. 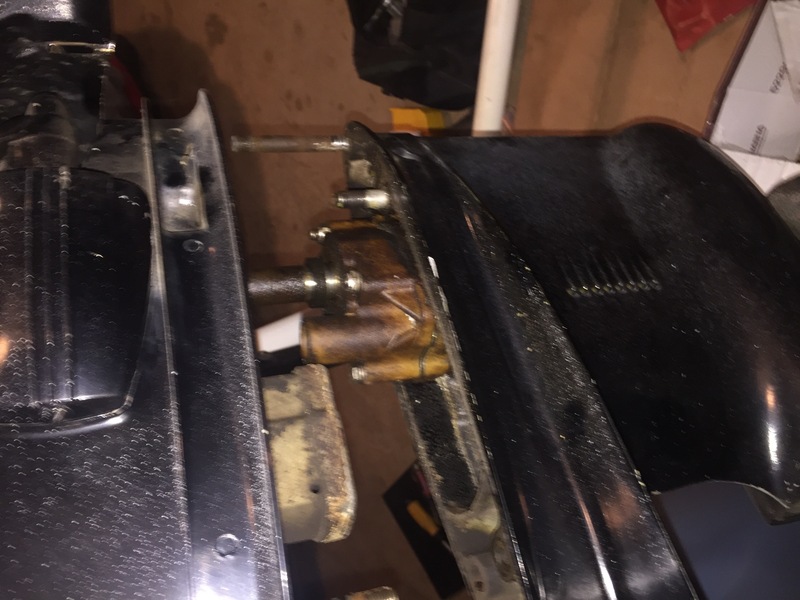 Rotten wiring, frozen lower unit, and 2 layers of rotted floor that owner ran screws right through the hull in 6 places screwing new seat bases down with drywall screws... it was NO classic so not worth the agrivation! Good to hear you're home recovering! Thanks. Now I just need to behave and take it easy and slow. Hope you get your project rolling in time for some progress by summer. A shorty with power trim should be sweet! Sorry I have been unable to advance this thread and finish the project. I still plan to pick it up when I can. Doctor told me today that the shoulder is frozen up with scar tissue 9 weeks after surgery and 3 weeks of therapy... so out came his long needle of cortisone into the joint. He will give me 2 weeks to break it free with therapy... if no luck he will knock me out and wrench that arm and shoulder like an ore coming down the Colorado river until he breaks that scar tissue up. I guess I have 2 weeks to stop rowing like a kid in a blow up raft and toughen up a bit. I guess I need to remember no pain, no gain. I just want to finish my Merc project without breaking something on the engine. Hopefully more another day but likely a month or 2 away.